What do they really think of children with SEN and their families? A busy weekend on social media has thrown an unwelcome light on the attitudes of a solicitors' firm regularly instructed by local authorities in SENDIST tribunals, Baker Small. However, whilst it is rare to see anything so overt, for many of us the events of the last weekend have merely confirmed what we already knew. 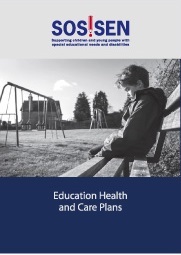 Local Authority Lawyers - What do they really think of children with SEN and their families?. "DON'T GET SNAGGED IN THE LA'S NET"
Just the thing you need - one for the wash, one for the wall and one for the LA officer. A useful and cheerful product, and it protects you against many fishy words! 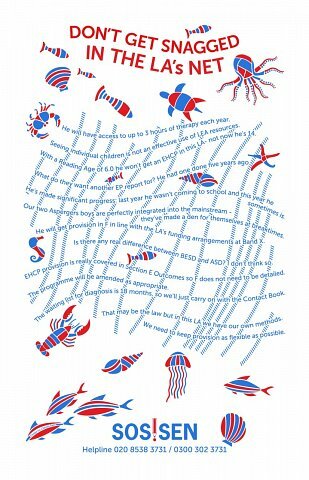 £5 (minimum donation) per tea towel. OKMT provides music and voice therapy for children and young people with physical, psychological, learning, behavioural and emotional difficulties. 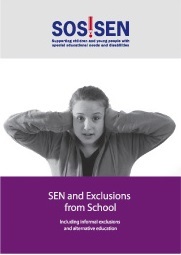 Booklets written by Eleanor Wright, SOS!SEN coordinator and solicitor. All proceeds fund the running of the Charity. Please note there is an additional charge for postage where the booklets are not collected in person..
SOS!SEN IS 15 YEARS OLD! 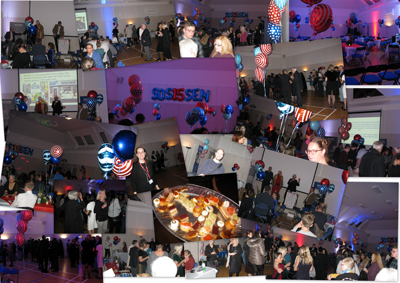 Congratulations to everyone for the success of SOS!SEN being 15 years old! We could not have done this without the trust of parents using our services when needed, our devoted volunteers and Trustees and all of the staff and volunteers at the two charity shops in Hampton Hill and Worcester Park. A special mention to our first coordinator Marion Strudwick for being at the helm for the first 12 years, and a special mention to Eleanor Wright who has been in charge for the last 3 years. Have you completed your Questionnaire and Feedback surveys?? What can a parent do when an LA has failed in its legal responsibilities? One parent wasn't about to take her local authority's unacceptable delay in conducting an assessment for an Education, Health and Care Plan go without challenge. 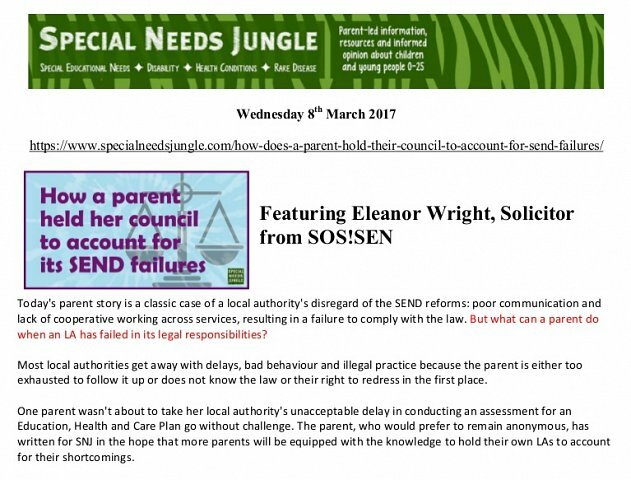 SOS!SEN and Eleanor Wright are featured in the article on the Special Needs Jungle website. 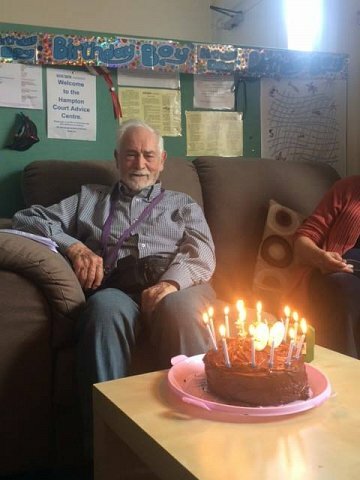 Bob celebrated his 90th Birthday recently, so we thought we'd put the spotlight on him and let everyone know a bit more about how he came to SOS!SEN. Bob has been honing his teaching skills for a very long time. We learned from his sisters that during his wartime Fleet Air Arm training he would pass his knowledge on to them when home on leave – they were the only children in the street to have been schooled in semaphore and flying techniques! Bob's formal teaching career was spent primarily at Brunel University where he lectured in mathematics and the then emerging subject of Computer Science. As part of his interest in computer graphics (another area which he pioneered), Bob discovered 3-D blindness and worked hard to help people develop counteract it – notnot only helping students to work visually, but also saving the lives of people parking on the motorway hard shoulder through the Parslow Parking Procedure he devised. This is just one example of Bob's life-long interest in problem-solving techniques. Bob was a Lib Dem councillor for Richmond-upon-Thames when he got involved in the fight against the closure of Oldfield House BED School. Despite the best efforts of all involved, that fight was lost, but it had drawn Bob in to providing advice for the parents affected by the closure. 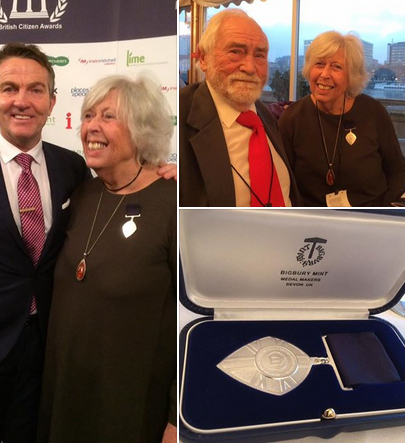 With Marion Strudwick (his partner of over 20 years) and Martin Dean, Bob set up SOS!SEN and has continued to be a stalwart in the charity. He continues to solve problems and provides advice to volunteers and trustees, as well as the parents and children we support. When he isn't busy with SOS!SEN, Bob's hobby is saiing. We wanted to say a big thank you to all of our helpline, advice centre and office volunteers at SOS!SEN. We rely on you all and we are very grateful for the time that you regularly give to help other parents with children with special educational needs. We are receiving a heavy number of calls from people who have appealed to the SENDIST and are worried because they are often not receiving information from local authorities and their representatives in a form they can readily download. Some have even missed out on the opportunity to oppose Requests for Changes from LAs because they had no idea that a document had been copied to them! This has severely prejudiced the conduct of their case. Even where a LA has informed them that a document has been sent, there is still a problem because of the complexity of the measures needed to download it. Some LA lawyers are refusing to send information out to parents on anything but such methods, even though they know that SENDIST itself refuses to accept documents transferred by such systems. These strategies are totally unacceptable, go far beyond password protection, and parents need to beware. The problem often lies with the use of external websites such as Egress that may be used internally within some LAs, but are extremely cumbersome and complex for many of us to use. The reason for using such methods is pretty obvious and not nice. Sending and delivery of documents (a) 13 (3): If a party informs the Tribunal and all other parties that a particular form of communication, other than pre-paid post or delivery by hand, should not be used to provide documents to that party, that form of communication must not be so used. In other words, inform the Tribunal and the LA that you do not wish to receive a particular form of communication. 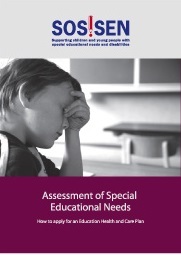 If the LA continues to try it on, then inform Tribunal with a copy to the LA concerned. Complain most strongly. Generally, of course, straightforward use of emails and PDFs etc. is fine. Due to parental demand, SOS!SEN are pleased to announce their new document check and drafting of documents services for parents/carers. We still believe that it is most important that parents should take full ownership of their appeals but recognise that the option of having a document initially drafted maybe a soloution for those who are too busy to carry out all the work involved. Please note in very exceptional cases a SOS!SEN volunteer can take over a case for a parent and there is no charge for any work. This service can only be offered to those who details are registered with us via previous and detailed discussion of their cases with the helpline, advice centres, 1:1 appointments, or our hands on workshops. Expressions of interest for this service and a form for this service can be found here. We are receiving worried calls from parents concerning less that ethically professional tactics being used by some LAs and their tribunal officers or legal representatives. Click here to see the details and find out what we advise you to do. 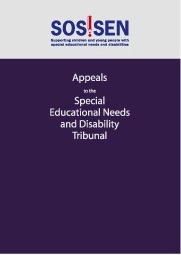 We are now pleased to publish our Report on Parent Experiences of the SEND Tribunal. It makes interesting and, often, worrying reading. Click here for the full Report. The Tribunals Service has responded in detail; you can read their letter here. We will be undertaking some further research in the future to get parental views on some specific topics. Eleanor is a solicitor who has been specialising in Education Law for 18+ years and has particular experience in cases involving SEN and disability, including social care issues. She has been named for several years in Tier 1 of Education Law solocitors in Legal 500 and Chambers Guide to the Legal Profession, and leaves a nationally respected firm Maxwell Gillott (also ranked no.1 in Chambers and Legal 500) where she has been a partner. Eleanor has long experience of working in legal aid for education and has been involved in many of the leading cases on SEN and disability law. She has been a school governor for over 20 years, has a long involvement with the Dyslexia Association and experience of sitting on and chairing school admissions and exclusion panels. She has been involved in a number of advice centres, workshops and training sessions with SOS!SEN for many years. SOS!SEN started life in the front room of the home of Bob Parslow and Marion in the London Borough of Richmond upon Thames following a decision by the LA to close Oldfield House, a much needed special school for children with behavioural and emotional difficulties. So totally blinkered and undemocratic was the behaviour of the LA, that a group of parents, governors, and professionals decided that although they might not win the battle to retain the school, they could make sure that every parent in Richmond had the chance to get help and advice: “We read up the 1996 Education Act, the Code of Practice, networked a range of professionals for help and advice, and set up a Helpline in 2002”. Nonetheless, SEN legislation has changed and there are crucial years ahead to protect children’s rights. 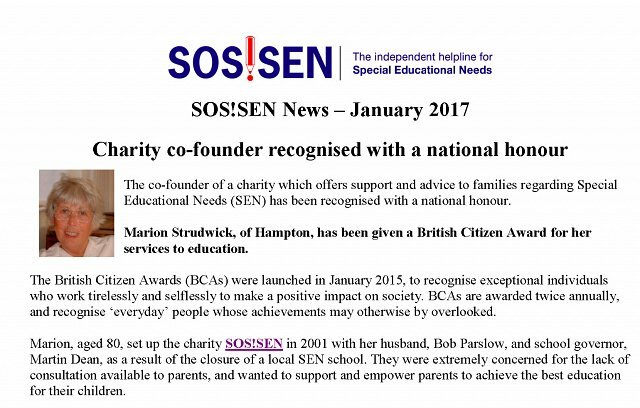 SOS!SEN is now a very busy national organisation and it is a good time for change and for a greater legal input to be provided. Marion’s successor has been appointed and will be named in the New Year. WATCH THIS SPACE! Everyone at SOS!SEN is thrilled at the new appointment and know it will take the charity to a higher level of national awareness and yet retain the friendly and individual case approach still to be headed by the volunteers. 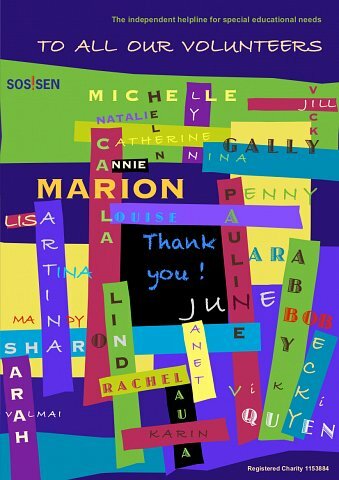 Everyone at the SOS!SEN team would like to say a huge thank you to Marion for all her hard work and dedication. "Thank you for always being at the end of the phone to help. Your advice has been invaluable and pivotal in making me realise that as a parent I AM NOT POWERLESS. Thank you!" Parental comment - 2014.